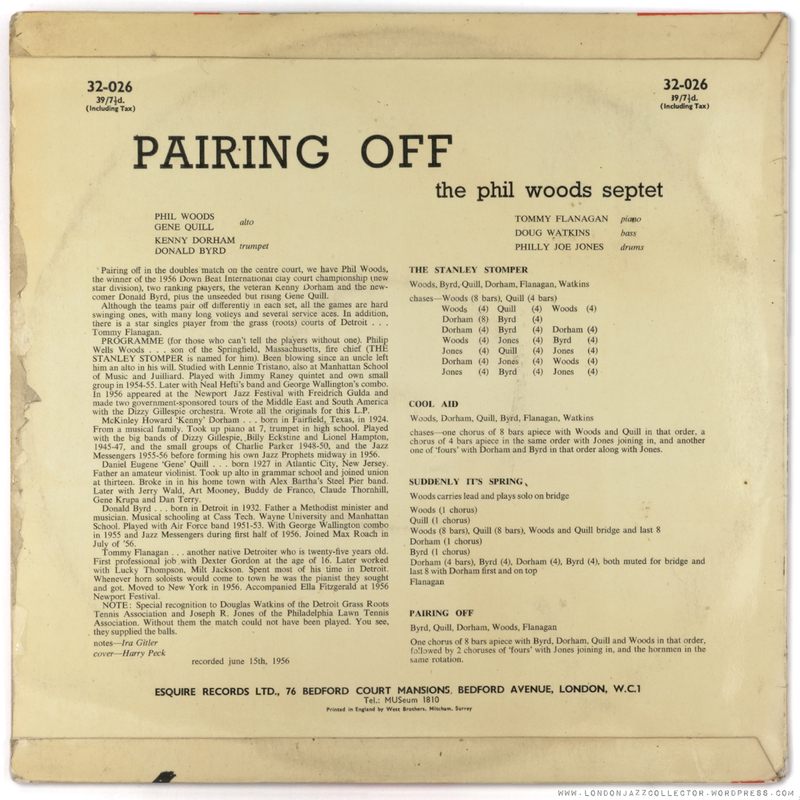 Note the Prestige discography attributes the recording date to the “Phil Woods Septet”, also found on the Prestige cover while Esquire’s cover settles for the naming of names. Such good names too, so why not put them all on the tin. Combative pairing pits alto and trumpet against different trumpet and alto, and rewards the listener with the benefits of competition. Fast and furious, no one left standing. Watkins, Philly Joe and Tommy Flanagan Provide the rock solid platform for the acrobatic delights. Today, this record would be packaged a “Street Dance” video, featuring two jazz hip-hop gangs, in a face to face stand off. The Phil Woods posse would taunt the Gene Quill posse, poking his alto defiantly in their face while soaring through a cascade of notes, followed by a backflip and body spin. Quill would then swagger, execute a few body-swerves, and then stab his alto at the Woods Posse’s faces, egged on by “Kenny D”, with high fives to the rhythm section. Rudy in a bandana, as MC Van Gelder. 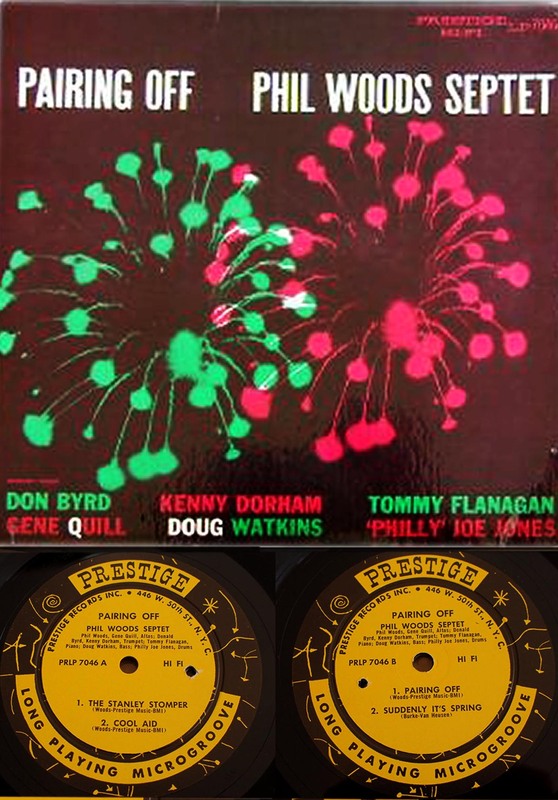 Vinyl: Esquire 32-026, UK 1st release of US Prestige 7046, below. The US original often fetches three to four hundred dollars, so it is nice to have the same pressing for a fair bit less than half that. 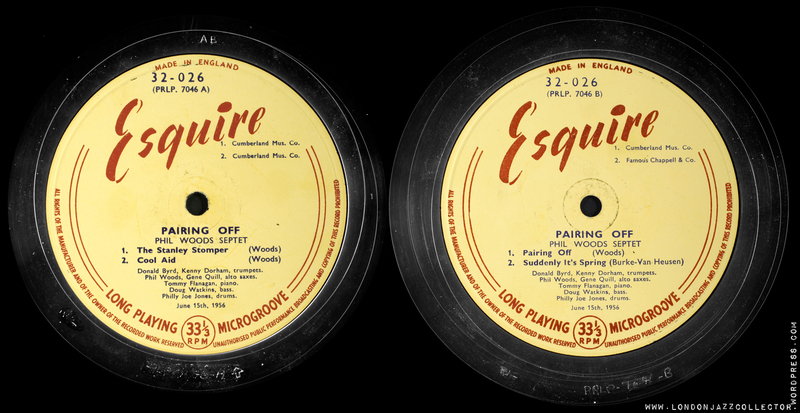 The run-out on the Esquire confirms the use of Prestige US stampers shipped to the UK to create the Esquire pressing. In addition to the signature RVG and original NY release Prestige catalogue number PRLP 7046, side one and curiously not side 2 shows a handwritten AB engraving at the 12 o’clock position (Abbey Manufacturing, NJ), and the small letters B1 at 3 o’clock position indicate the stamper number. It’s Prestige Jim, but not as we know it. A relative rarity, even for eBay, this was the only copy I had seen, and it had the word “MINE” stamped on the front in large friendly letters. Clearly a couple of other bidders had not got the message or English was not their native tongue, so it was time to take a hammer to the piggy bank, and push the boat out, into three figure waters. Some lucky guesswork on my part won the bid and up flashed the “You have Mail”. We have good news and bad news. The good news is, you have won this record. The bad news is, you have won this record. Time to pay. When I first started out bidding on eBay I used to be quite annoyed when I lost out on an auction. Then I remember one night going to bed having left three large bids on records in another timezone, only to wake up at first light in a cold sweat: “OMG, what if I win all three! !” (Luckily it was only one).With some of today’s record prices it’s often quite a relief to find you have been outbid. I tried to explain once to my better half – it’s not like gambling. On eBay, losing is free. It is winning that is expensive. 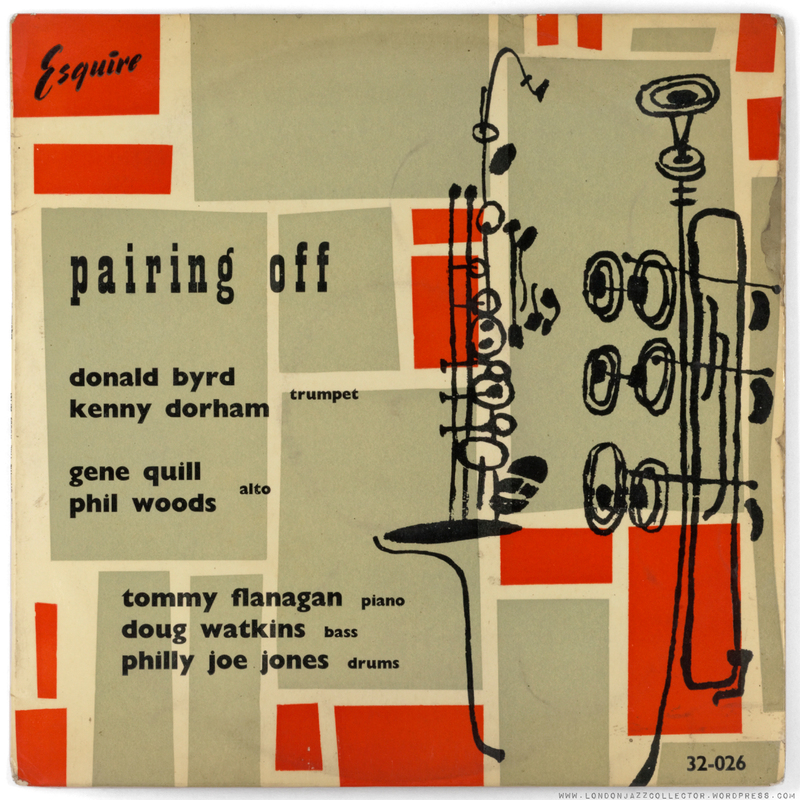 This entry was posted in Donald Byrd, Esquire, Kenny Dorham, Phil Woods and tagged Donald Byrd, Doug Watkins, Esquire, Gene Quill, Kenny Dorham, Phil Woods, Philly Joe Jones, Tommy Flanagan by LondonJazzCollector. Bookmark the permalink. This posting turned me on to this LP and today I found a Japanese pressing, thanks! Just discovered this lost gem today. Never heard of Phil Woods but when I saw the heavy hitting names, I thought it was worth a listen. Fantastic stuff, very underrated lp. Now I just need a copy! Sorry, I went “anonymous” by mistake…. I REALLY enjoy reading your articles. This is a self-taught passion to me so, it’s nice to see I’m not alone!!!!! Thanks for this horn of plenty you’r writing every day! Glad to have you around Enrico. Sometimes it does feel like you are alone, I’ve had that, but there are a lot of great people out there, all filled with love for this great music. There are many adventures still to be had. This is an exciting time. And for once the technology is on our side.